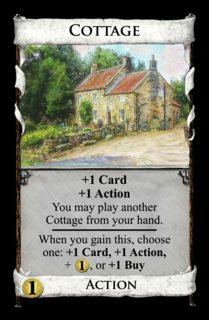 Cottages are quite humble, but gather a few of em together and, hey, maybe you've almost got a quaint little village or... Town of the Year, or something! And they are quirky enough to be fun (remaking your junk has never been more habitable....now it's a junk-cottage, and you have extra cash for some reason.) and very cheap. You can't look through your discard pile because some people would slow down the game by repeatedly pawing through it, considering stuff. Originally you could count it. Valerie didn't like that you had to count it face down, and that we'd have to tell you that. So you can't count it either. 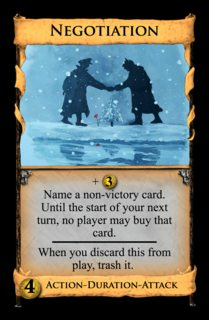 Having familiarity with these concepts/the basic rules of the game makes it pretty easy to play even with cards you have never heard of before. Do everything from top to bottom on the cards you play, and try to win. 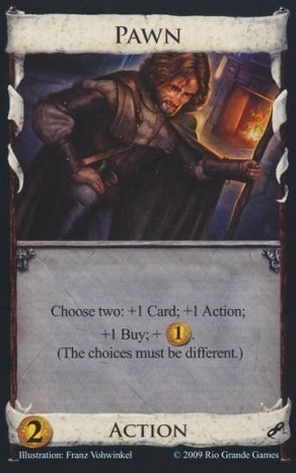 And even though precision is often important, one does not need to think about what's precisely happening every time a card is played so long as the consistency of the effects with the rules is maintained. It is on this note that I might call attention to the card Hermit as an example. Hermit is a pretty easy card to use, and fun to play with. You can trash curses that someone else just gave you, and you can maybe gain madmen later. This ease has made the majority of the Dominion community fall into a slumber, one which I now hope to disturb. What is going on when one plays Hermit? 2. THEN one may trash a card from either their discard pile or their hand. Why is step one included? Knowing the contents of one's discard pile is only marginally useful; the whole step seems to be a waste of ink! Of course, we don't actually think this way. Looking through one's discard pile is essential, because otherwise step two would have strange conditions of fulfillment--one would have to KNOW what is in their discard pile without looking, and the general spirit of the Lose Track Rule seems to be: one cannot know what one does not see. Once this knowledge is acquired, trashing from the discard becomes a matter of ease. What have we established here? That one does not have to be in the process of "looking", in the technical sense, in order for the knowledge obtained from that looking to be able to be utilized by a card. 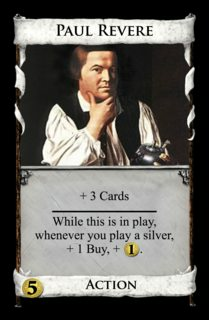 Let us suppose that we had a Reaction card which reacted to being looked at, much like Patron reacts to being revealed. (The details of this TBD; we can at least assume it would be triggered by Hermit). The Reaction effect would be something like: "put this on top of your deck". There is a question as to, when this card is triggered by Hermit, one can trash a card from one's discard pile. What if the reaction allowed you to put two cards from your discard onto your deck? And so on. There seems to be an ambiguity as to when one's knowledge is sufficiently disturbed in order for a card to play its proper function. Hermit depends on a specific observation of a discard pile in order to carry out its trashing function; if one wanted to be really precise, it seems plausible that any change in the pile in question would prevent the trashing. This discussion of the interaction of Summon and Death Cart is also of note here. Summon knows it gained Death Cart, but since two Ruins are sitting on top of it, Summon can't track it and set it aside. Darn! Here's the fix. Summon should be worded: "Gain a card costing up to $4--but first, watch your discard pile very carefully until this Event is done resolving. Set it aside--carefully. If you did, then at the start of your next turn, play it". Also, I'm sorry for writing this. When you gain this, gain an Estate, a Curse, and a Like Nothing that doesn't come with anything else. 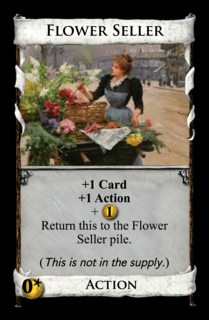 EDIT: A good question to be asked: how many flower sellers are there? The answer: equal to the number of avenues in the supply (which itself follows standard victory card rules). It seems like this works fine, even though it is, indeed, post-buying a card, since crown directly tells you to play a treasure. Thought of this one a few weeks ago, finally made it into card form today...hopefully, it still counts! you can now megaturn with stewards and bridges. that's pretty neat. I wanted to design a card that reflected the simplicity and subtle versatility of my favorite chess piece. Don't know how well it turned out....tell me what you think! This one is maybe (=definitely) unwise for logistical reasons, but I think it's balanced! Come to think of it, I will have to think about which Villager-giving cards count as 'Villages' in my random kingdom generator. I think it’s a case-by-case thing. Acting Troupe and Recruiter count as villages. Sculptor and Silk Merchant don’t. I think they should all count. They all enable more than one terminal action to be played in the same turn. For pedantic purposes, sure. For a kingdom generator, no. 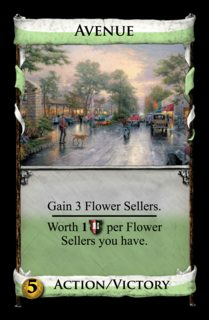 Isn't the purpose of "always include a Village" in a Kingdom generator more or less to "always provide me with a way to play multiple terminals per turn"? To borrow an old saying: Knowledge is knowing that Silk Road is a village. Wisdom is not trying to use it as one. ...and true mastery is realizing that Silk Road isn't an action at all! I don't really think Lurker needed this boost! Innovation General Discussion / Well, this board is dead BUT has anyone played with the new Artifacts expansion? Gain an ant farm. You may discard any number of actions. +1 card per action discarded. When you buy this, you may trash any number of ant farms you have in play. If you trashed any, gain an action card. How about reducing the ability a bit to make it quicker? Eg When you would shuffle your deck, remove up to 4 cards from it, shuffle the rest, then place 2 on the top and 2 at the bottom. That's enough to set-up a village-smithy at the top of your deck and send a couple of stop cards to the bottom. Perhaps bumping it to 5 cards, and allowing you to place them anywhere in the deck, like secret passage, would make it worthwhile but not painful. 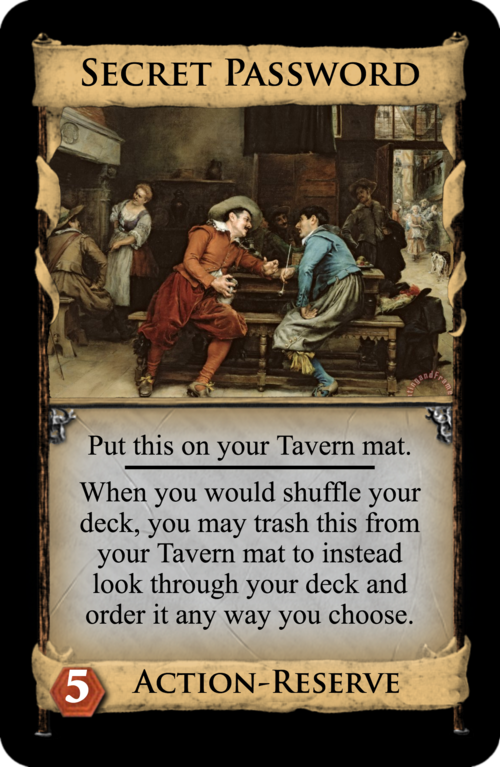 When you would shuffle your deck, you may trash this from your tavern mat to instead look through and arrange your deck in any order you choose. The problem with the card, I think, would be that it would take FAR too long to resolve. It would be both pretty irritating for the person who used it and the other player. So, I need to find a way to retain the idea of the card, but also fix the time issue. Thoughts? Rules Questions / Re: Self-Pin?